The first thing that catches your eyes when installing the trading platform xStation, its updated attractive design. Dark background, vibrant colors — all made for maximum convenience, from the point of view of perception of colors: the most important catches the eye in a split second — the quote of the price movement etc. xStation — innovative modern terminal for trading in Forex. The developer took into account the wishes of traders from all over the world and made significant changes that distinguish the platform from the classic MetaTrader 4-th and 5-th version. In the timekeeping mode, xStation allows you to conduct operations with various instruments, starting from currency and stock indices, shares and options. The developer of the trading platform is famous among traders x Open Hub company, which is licensed by British regulator FCA. selection of the least successful traders and giving a completely opposite orders on the same asset. 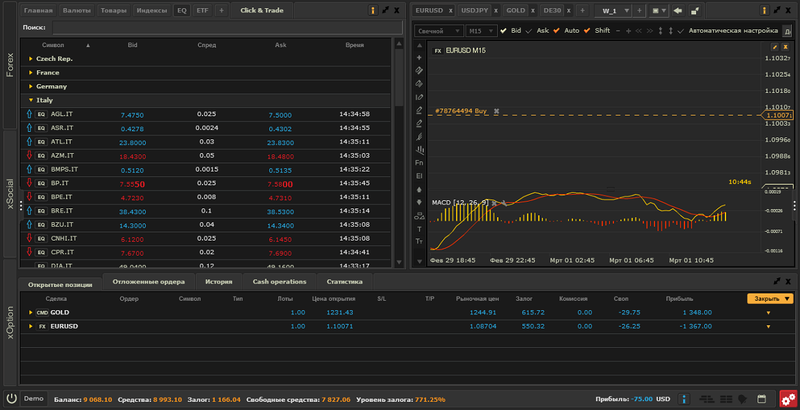 List of traders can be seen in the add-in of the platform xSocial (left vertical menu). This trading option for those who have not yet figured out in existing strategies — it is enough to repeat the actions of more experienced investors and learn to slowly develop something of your own. benchmarking can be applied to one chart, the price movement of different currency pairs. Try to open a demo account with xStation terminal and you will quickly see the ergonomic design that allows you to control everything in trading processes, information, and offer popular tools, indicators, oscillators technical analysis is able to surprise even the professional. Tools displayed in the left menu of the window “Graphics”. xStation ECN — the essence of the account in market execution of orders according to the principle of market depth, the spread is floating from 0 points. An important advantage of the platform is its impeccable performance: from the first minutes of trade the trader can be sure that the terminal works fast, no slowdowns, and this is an important factor in operational decision making. To install the classical orders Stop Loss and Take Profit after you have opened a deal, enough to pull the mouse in the right place on the chart price trend and confirm its movement. This handy feature of xStation distinguishes the terminal from other platforms, where the values of orders you need to enter with numbers manually. Like other platforms, xStation works well with advisers which need to be loaded by yourself. Important: advisors written using the MQL language can not be installed on the terminal. You need to find the software in add-in xStore (store indicators and advisers from xStation) or your broker. Part of the software in store is free! Registration in the xStation platform is simple: open a demo account on the broker’s website and download the program. Some brokers allow you to work in the terminal directly from the browser without installing the software on a stationary computer. We sincerely believe that in xStation trading platform, everyone will find something of their own, because this terminal is interesting and unique at the same time. It is cool, simple and exotic. Just try it and it is quite possible that you will decide to remain in the stock markets with xStation forever. Good luck and good profits!